Artist Paint Brushes : Painting Techniques| Oil Paintings :: How to Paint Realistic and more! Old-fashioned brushes were much longer, in length of hair and of handle, than their modern equivalents. Renaissance artists had brushes that they could flourish in a way that only orchestral conductors can now enjoy. Still, for outdoor painters, it is probably less romantic but more practical to have brushes that can be held comfortably and easily, with the clipped hair which comes from short-haired animals. Short or long, the most important points about oil brushes are having enough of them and keeping them soft and flexible. I have dozens of brushes in my big oil-painting box, and recommend that you take at least two long-haired sable ‘writers’, size 4 or 6, six large hog hair brushes and six smaller hog hairs. The reason will become apparent the minute you start to work. 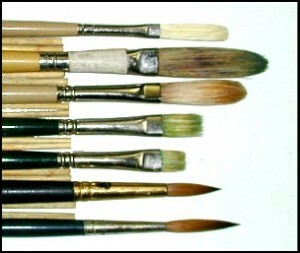 Each brush holds one of the colors you are using, or one of the mixtures that you have made from your primary palette. Since oil paint dries slowly, you need not dip the brush into turpentine again and again, as you do with water and watercolor; so the brush can stay either on the table or in your hand, ready to be used whenever you want to add something in that color to the picture. This is convenient; it wastes little paint, and you don’t have to clean up until the end of your day’s work. .
Acrylics should be washed off with water, never with turpentine, and you must not allow them to dry hard on a brush – they will be almost impossible to remove. You will have to use stainless steel or plastic palette knives. The photograph here shows my big oil-painting palette with the colors laid out, as well as the fairly small selection of brushes that I take with me on any expedition. I usually add another large ‘house-painter’s’ brush, for those first wide washes of earth and sky. I keep two of these, one for the blue tones and one for the greens. Even the slightest flake of another color on the blue brush (or vice versa) will eventually turn up just where I don’t want it. Never be afraid to spend good money on good brushes. I have had some of mine since I was twelve years old, and they are as soft and flexible as they were when I first went to art classes. Of all painter’s tools, brushes become the most personal and most responsive to your way of working. It’s true the most important is to have enough brushes.